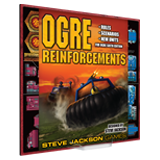 Just a quick update to let people know that Ogrezine, Mark II is being released and fans should begin to see notifications in the near future. I hope you enjoy this as much as the first issue; personally, I think you all have raised the bar! I look forward to future submissions for a presumed Ogrezine, Mark III, especially with all of the Ogre Playmats released, just begging for some scenarios to be made. 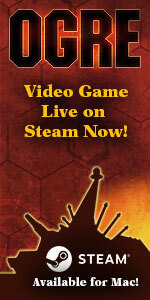 The new Ogre Playmats, M6 and M7, are now available on Warehouse 23. Plus, you can order any of the Ogre Playmats (including M2, the "Iron Mountain" playmat!) as part of the Pocket Box Games Kickstarter. 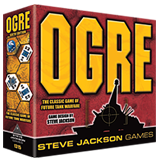 Those, plus lots of other Ogre goodies, including the classic Ogre games and supplements as well as pocket folders and journals for your gaming needs, are still available as a preorder. Get your order in today before the window closes. Finally, we are allowing more preorders of the amazing Ogre Miniatures, Second Edition hardbound book and counter sheet set. You can find that on Warehouse 23, too; check it out before they are gone.